According to a set of intelligent humans interviewed for this story, artificial intelligence (AI) and machine learning are going to help drive the tech economy in 2017. When CIO.com posted a query on Help a Reporter Out, a site designed to help journalists connect with sources, asking about startup trends to watch in 2017, the overwhelming majority of respondents pointed to AI. This coming year and beyond, AI will help companies "disrupt sectors that haven't been fully disrupted," says Anthony Glomski, principal of AG Asset Advisory, a financial advisory firm. "AI is in its beginning stages with massive potential impact." Here are eight startup categories and trends experts believe will be big in 2017. In 2016, large companies invested resources in making tech smarter and better at predicting things using AI, according to Ludo Ulrich, head of startup relations at cloud CRM provider Salesforce. Technology simultaneously advanced enough to let smaller companies take part in the AI revolution, he says, and universities started to offer classes meant to educate students about AI's possibilities. These developments are "creating a larger talent pool" of AI-savvy workers, which will help foster innovation at a much quicker pace in 2017, according to Ulrich. "Now that the true importance and impact of AI has been discovered and has become more accessible than ever before, 2017 will be the year where the knowledge that used to be possessed by a select few will now become imbued throughout the tech landscape — allowing for younger startups to truly innovate in the space," Ulrich says. In the past, only a few companies had data scientists on staff and access to machine learning resources, according to Ulrich. Today both are "basically expected," he says. At its fall 2016 Symposium/ITxpo, research firm Gartner identified AI and machine learning as one of its top 10 strategic tech trends for 2017. "Applied AI and advanced machine learning give rise to a spectrum of intelligent implementations, including physical devices (robots, autonomous vehicles, consumer electronics), as well as apps and services (virtual personal assistants and smart advisors)," according to David Cearley a Gartner vice president and fellow. "These implementations will be delivered as a new class of obviously intelligent apps and things as well as provide embedded intelligence for a wide range of mesh devices and existing software and service solutions." Wells Fargo is among the many enterprises that are testing AI technology, according to Braden More, the bank and financial services company's head of payment strategy. "We're exploring how AI technology can enable customers to conduct a banking transaction while on social media," he says. "We're also exploring AI virtual assistants that can proactively support customers through alerts, reminders and contextual suggestions." And AI can be used to detect bank fraud, Braden says. AI is expected to play a growing role in cybersecurity in 2017, as well. One reason why is that not enough people with cybersecurity skills exist to fill the available jobs. An estimated 1 million cybersecurity jobs are unfilled worldwide, according to Cisco. At the same time, the number of cybersecurity job openings is expected to increase to 6 million worldwide by 2019, Symantec reports. "The reality is that cybersecurity knowledge needs to be automated in some way," says John Shearer, CEO and cofounder of DarkLight, a cybersecurity analytics and automation provider. "Startups will emerge that recognize this huge market need for blending human expertise with AI. AI systems that can be taught by human experts, and human experts that can be taught by AI systems, is what the hottest startups will focus on." Big data — and the sheer volume of data the world currently accumulates — is another driving force behind AI's rise. Every day, the world generates 2.5 quintillion bytes of data, with 90 percent of data in the world created in the last two years, according to IBM estimates. Enterprises need AI to learn from their customers' trends and patterns, build automation for greater efficiency, and help employees be more intelligent in their work, says Steve Goodman, a partner at VC firm Toba Capital. Chatbots are automated services that interact with and offer information to humans, especially consumers, through a chat interface. And AI is one of the technologies that's helping to make chatbots mainstream. "Thanks to AI, we've seen chatbots take center stage in 2016, and as we break into 2017, we expect this trend to spur even more innovation, specifically in the enterprise," says Ashu Garg, general partner at Foundation Capital, a Silicon Valley venture capital firm. Businesses will increasingly look to chatbots to help reduce spending on customer service, and insurance and financial services representatives, "fields that are ripe for disruption," Garg says. "Chatbots will be 'hot' simply because there is much to gain." More than 85 percent of customer interactions will not include a human being by 2020, and chatbots will be the No. 1 consumer application of AI during the next five years, according to research from Gartner and TechEmergence, as reported by Business Insider. In 2017, expect "a flurry of messaging platforms to open their platforms for chatbot integration," Garg says. "While Facebook is still the dominant messaging platform, WhatsApp, Kik, WeChat and other globally relevant messaging platforms will fuel chatbot innovation and healthy competition. As the technology gains traction and AI technologies continue to advance, we'll begin to see chatbots become increasingly integrated with companies' backend systems, changing the way people communicate with businesses." Cybersecurity was frequently in the news in 2016, thanks partly to Apple's iOS encryption skirmish with the FBI and other tales of ransomware attacks against businesses. Many experts expect continued growth in the cybersecurity space in 2017. With every new attack vector or vulnerability exposed in 2016, "a cybersecurity company emerged to fill the space," says Nate Locke, partner at investment management firm Kayne Anderson Capital Advisors. "Companies looking to beef up their security defenses invested in software and other appliances. We anticipate businesses will start investing less in endpoint solutions and more in managed services that help them make sense of their existing infrastructure." Security is complex and hard to manage, according to Locke, "and while enterprises have invested heavily in security products, many are not getting enough value from these technologies. In 2017 and beyond, we see the role of managed security service providers as increasingly important in helping organizations reduce the risk of a security breach." In 2017 and beyond, enterprises will undergo a digital transformation "on a massive scale," according to research firm IDC (a CIO.com sibling company), enabled by the so-called "Third Platform" of cloud, mobile, big data and analytics, and social technologies. "We are at an inflection point as digital transformation efforts shift from 'project' or 'initiative' status to strategic business imperative," said Frank Gens, IDC senior vice president and chief analyst, in a November press statement. "Every (growing) enterprise, regardless of age or industry, must become 'digital native' in the way its executives and employees think, what they produce, and how they operate. At the same time, Third Platform technology adoption and digital transformation is happening much faster than most expected and early competitive advantages will go to those enterprises that can keep pace with the emerging DX (digital transformation) economy." IDC believes the cloud will be a prime enabler of digital transformation, and it predicts that by 2020, 67 percent of enterprise IT infrastructure and software spending will be related to cloud-based technologies. During this transition, nearly every enterprise will be a cloud service provider of services to its own marketplace, making cloud capabilities an IT concern as well as a core business operations issue. In the aftermath of the Pokémon Go phenomenon, augmented reality (AR) is on many people's radar. AR's big sibling, virtual reality (VR), also offers exciting potential for enterprises in 2017 and after. During the coming year, 30 percent of consumer-oriented Global 2000 companies are expected to experiment with AR and VR in their marketing initiatives, IDC predicts. "Interfaces are the essential gateway to customer engagement and they are evolving much faster than many have anticipated," the research firm says. "IDC expects AR/VR to reach mass adoption levels by 2021, when more than a billion people worldwide will regularly access apps, content, and data through an AR/VR platform." But VR won't simply be a technology for entertainment. "In 2017, VR is going to be adopted by a lot more startups to collaborate with in-office employees and remote or gig workers," predicts Zach Holmquist, CEO and cofounder of Teem, a cloud-based service for managing workspaces. "VR will be used to accommodate the evolving definition of 'employee' to include both in-office and gig workers contributing remotely. The gig economy will continue to grow, forcing companies to use all available resources to accommodate this emerging category of employee, and VR technology is going to help them meet that goal." After the fall 2016 presidential election, California, Massachusetts and Nevada joined the growing ranks of states that have legalized recreational marijuana. A total of 26 states and the District of Columbia now have laws that permit recreational or medical marijuana use. 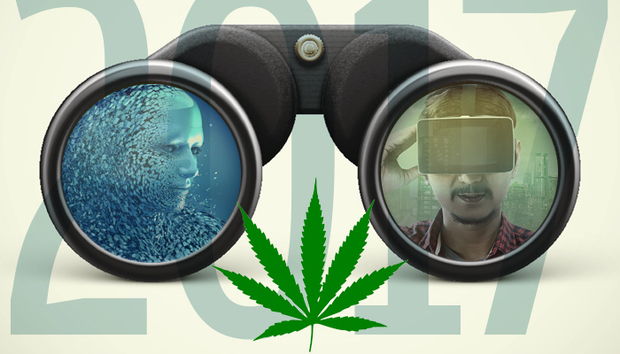 Consequently, startups focused on marijuana are expected to proliferate in 2017, leading to "innovation on the technology side of the cannabis industry," according to Chris Walsh, editorial director of Marijuana Business Daily, as quoted in the Daily Democrat in Denver. The breakout hit Spectacles from Snap, the company behind Snapchat, which let people record and share up to 10 seconds of video, are "breathing new life" into the wearables category, according to Gregory Kennedy, cofounder and president of Uncharted Minds, an organization that hosts events and conferences. "It appears that Snap's fun, quirky and inexpensive approach has the winning combination of features and pricing that all the other players missed in the first wave of wearables." "Intelligent things" are at the intersection of AI and IoT and are among Gartner's top 10 strategic trends for 2017. The internet of intelligent things goes "beyond the execution of rigid programing models," exploiting AI and machine learning "to deliver advanced behaviors and interact more naturally with their surroundings and with people," Gartner says. "As intelligent things, such as drones, autonomous vehicles and smart appliances, permeate the environment, Gartner anticipates a shift from stand-alone intelligent things to a collaborative intelligent things model."